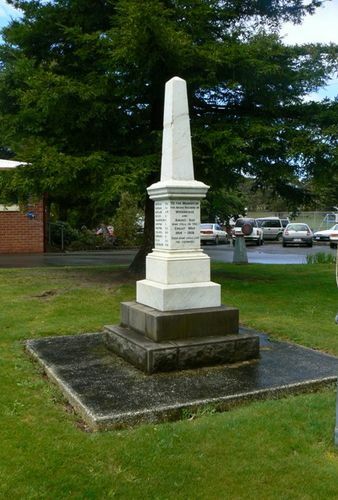 A memorial commemorates the soldiers of Woodbridge and Birch's Bay who died or were killed in World War One. Yesterday, the Mayor of Hobart (Colonel Snowden M.H.A) unveiled an artistic memorial column to those who fell in the great war. It was erected by Mr E.G. Luckman of Hobart, at a cost of £60 raised by public subscription, and is in the form of a marble obelisk, mounted on two bluestone steps. The Mercury (Hobart), 24th February 1920.